Make this a lucky weekend to remember at Intertops Casino with 50 free spins on the Fucanglong slot and a 100% match bonus. Redeem the bonus code WKNDLOOT to claim your free bonus up to $500 and 50 added free spins! Good luck! No max cashout! This bonus offer is valid until 14th April, 2019. Min deposit is USD 20. Max. bonus amount is USD 500. Free spins are only valid for "Fucanglong". Any winnings from free spins are subject to 10x wagering. For the deposit bonus standard wagering requirements apply (30x deposit + bonus). Please read the bonus terms and conditions online. Valid from Friday to Sunday, once a week. Standard wagering requirements apply. 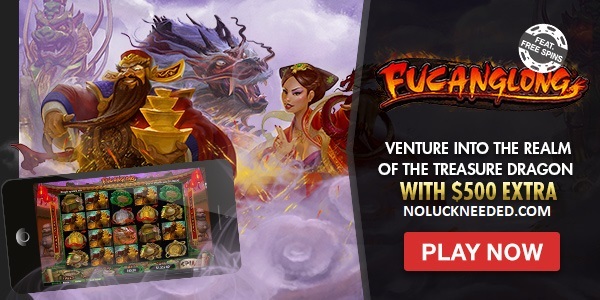 Play with Fucanglong Free Spins at Intertops Casino!